Many people working in advertising prefer not to broadcast their personal political beliefs for fear of upsetting the often delicate client/agency balance—and giving their PR teams something else to worry about. So, mark this as yet another unwritten rule destroyed by the rise of one Donald J. Trump. Small and mid-sized agencies like barrettSF, Walton Isaacson and TDA_Boulder have all created somewhat self-promotional stunts based on Trump's "divisive rhetoric." But Momentum Worldwide creative director Arye Dworken had a more specific goal in mind—encouraging as many people as possible to stop following the Republican presidential candidate on Twitter. "Like most people, I'm super frustrated about the Trump nonsense," Dworken tells AdFreak. "I'm not very politically active; I read the paper and have conversations, but I work in an industry where we … don't have the bandwidth to do things politically." Trump's Twitter influence inspired him to take action. Over the past few months, the mogul has won headlines on multiple occasions for sharing tweets written by self-described white supremacists, but these stories don't seem to have damaged his campaign or the public's can't-look-away interest in his candidacy. His 7.77 million Twitter followers include many people who don't plan on voting for him and at least some who consider him a joke. Dworken said he has several colleagues who find Trump to be amusing and/or revolting in equal measure, and this is hardly a surprise given The Huffington Post's now-embarrassing decision to relegate all of its coverage of The Donald to its Entertainment section. "A co-worker told me, 'I follow him and I can't stand the guy'," Dworken said. "But I think that's a destructive attitude. When this guy signs on to Twitter every day, that's what he feeds off of. By unfollowing him, you're almost signing a petition." Therefore, Dworken and his team have encouraged friends and colleagues to unfollow Trump using the site, which automatically posts a tweet expressing the unfollower's support for denying him even a miniscule portion of the attention and instant gratification that he so obviously craves. "This whole Trump thing really pissed me off," Dworken said. "Do we really need more toxicity and narcissistic anger in our lives? Why do we subject ourselves to these things? I have children, and it legitimately concerns me … it was a sobering cold shower." The project is just getting started, and it has not been promoted outside Dworken's circle of friends and colleagues. 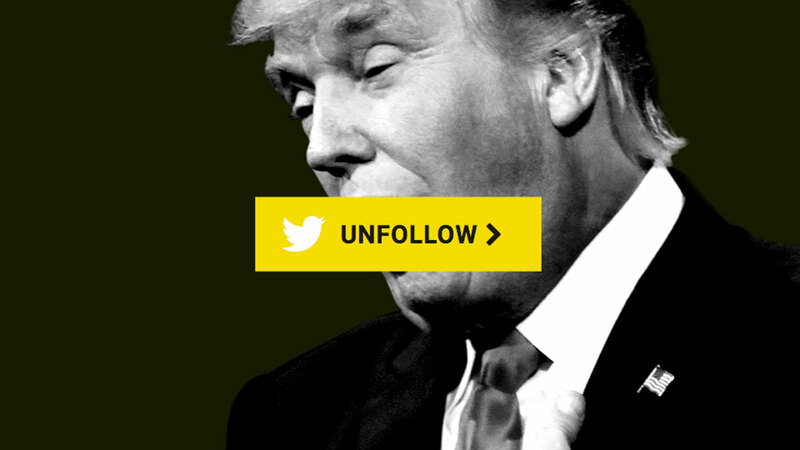 But so far the group has inspired almost 5,000 people to unfollow Trump, according to its own tracker. It's worth noting that the #UnfollowTrump hashtag has been used in the past by individuals across the political spectrum who have the same basic theory: The man's growing follower count only makes him more likely to repeat the sort of behavior that inspires pieces like this exhaustive New York Times rundown of the people, places and things he has insulted on the short-form messaging network. As one tweeter who did not disclose her political leanings put it, "Please everyone #UnfollowTrump … you're just encouraging him." With a little help, perhaps Dworken and his colleagues can take at least one tiny step toward their shared goal: "Make Twitter Great Again."